The Hollywood Sign is a Los Angeles landmark recognized worldwide. 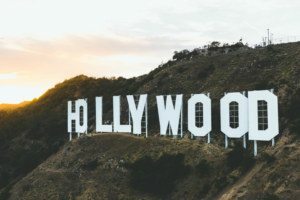 While the sign is synonymous with entertainment it was initially created to promote a real estate development located in the Hollywood Hills known as Hollywoodland. With the onset of the Great Depression the project went bust but the sign remained standing. But it wasn’t too long before another letter tumbled down the hill … and one was even set on fire. In the early 1970’s Gloria Swanson funded another restoration but by the end of the decade more attention was needed. Today, this Historical Landmark remains cemented in pop culture, is a sight for touring eyes, and it retains that magic and allure of making it big in Hollywood. Explore more of Los Angeles by clicking a topic below.